Still no sign of any ships: I rented a truck and wandered into the hills between Nadi and Lautoka, a region of feathered rows of cane and rivers and a dam high up on the torn volcanic skyline they called the Sleeping Giant. Maloni should have been collecting firewood, but he was born under a truant sign and preferred to wave to his friends from the window of a white man’s car. The firewood was for the funeral feast of his small mother — the wife of his father’s brother — who had died two days earlier. The road to the dam was impassable. When we reached the greasy Nadale river and could go no further, his small uncle, the dead woman’s husband, was waiting for him. He jumped down from the cab of an old flatbed truck and cursed Maloni, waving his arms and kicking him towards the bank, where the wood had been carried by the floods. Maloni slouched off while his uncle turned to me. He would be honoured, he said, if I would come to the funeral. In the village – two collections of cinderblock huts gathered round grass squares, the gaps between filled in by breadfruit trees, palms, and small garden borders – a cow had been slaughtered. Collops of bloody flesh hung on wires, visited by squadrons of flies, but when it was served, on the ground where the village sat waiting, men at one end of the square, women at the other, it was accompanied by chili and lemon and cassava and braised to perfection. There was a brief disturbance as the kitchen roof collapsed; otherwise the fête champêtre was flawless. After lunch and the sevu sevu ceremony – a moment of meditation, drinking yaqona that tasted like snot with cement in it, in a room with the slaughtered cow’s rump and tail hanging in one corner and Holy Families and news cuttings of local boys who had made the national rugby side taped to the wall – Maloni came to say that more cassava was needed. We took a different road. The traffic changed from tractors to horses to nothing. Five men disappeared into the canefields and I sat for three hours under a mango tree while the thunderheads gathered over the Sleeping Giant. Maloni’s hands were clean when he came back, and he took no part in the loading or unloading when we returned. The church service was already over and the committal was about to begin, on a mound already covered with rough concrete tombs. Maloni’s small mother was in her forties and had died of a heart attack. Through the glass pane in the top of the plywood coffin, her face was shockingly grey. The ceremony was simple, the sort of thing you would find in an English village churchyard on an overcast afternoon, with a few variations: the choirmaster passed round the Benson & Hedges between hymns, and at every stage I found myself pushed forward, almost on top of the coffin, to take photographs. Weighed down by mats and mulberry-bark cloth, the coffin was handed to four pallbearers – one had the word ‘Luv’ tattooed on his shoulder – wearing blue sulus and grass armlets and necklaces. They filled in the earth and planted a bough of frangipani at each corner of the grave, and it was over. Fifty metres away, while the burial was going on, the village boys had slaughtered another cow. They wanted my truck to carry it to the village square. So another body was manhandled into position. Maloni was the butcher-boy, Josaia said; inevitably it was all the others who were red to the elbows. Leaving the guts in the bush, I drove back up the main path. The square was a curious scene. The lawn was strewn with piles of funeral gifts from the dead woman’s parents on the chief ’s side of the village, each heap including a five-gallon drum of kerosene, several mats and a length of decorated tapa cloth. In front of these lay the corpses of another cow and calf, both headless, as if they were surreally tired and unable to go a step further. That day nobody, save Maloni, had done anything for themselves which was not also for the village. I tried to imagine what John Thurston [a former cotton planter who became governor of Fiji in the 1890s and who was impressed by the locals’ communality] would have made of it. A realist, he would probably have been surprised that the communal ideal had survived so long against outside influences, and depressed at the quality of the influences that were slowly altering it. They were easily guessed: videos; beer; cigarettes; eager thoughts of other consumer desires to be fulfilled. But if the appeal of traditional communities comes from their means of expression, what was missing was more revealing. When I asked Josaia on what occasions the village performed their mekes – the dancing for which Fijians were once famous – he answered that the bus came every Saturday and took them to the Mocambo Hotel where they performed for three dollars each. If you wanted to see Fijian culture without self-consciousness, I thought, it was much the same as at home. Funerals were more enjoyable than weddings by a long way. Except for the bereaved. 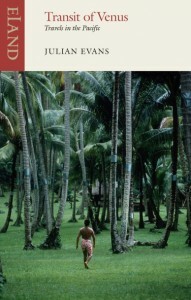 Extracted from Transit of Venus: Travels in the Pacific by Julian Evans (Eland). © Julian Evans, 1992, 2014. Julian Evans grew up on Australia’s east coast and in the south London suburbs in the 1960s. In 1990 he left his job to island-hop across the Pacific Ocean by ship, small plane and boat. He has written radio and television documentaries and contributes to publications including The Guardian, Prospect, The Times Literary Supplement and L’Atelier du Roman. He is also the author of Semi-Invisible Man: The Life of Norman Lewis. For more of his work, see his website.